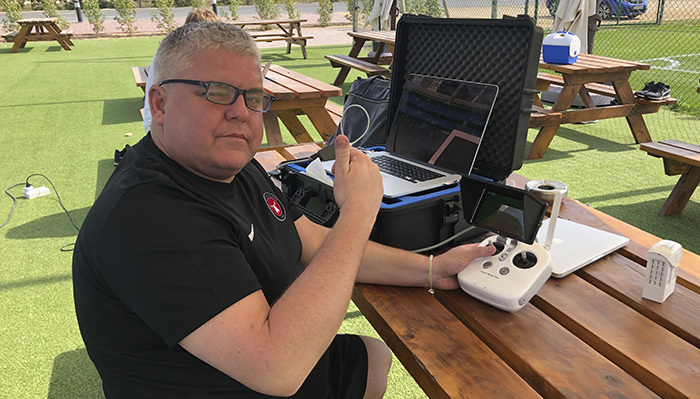 When you are at the traing sessions at Jebel Ali Center of Excellence, you can her the buzzing of the drone over the head of the players, and you will se the smiling face of the drone pilot. - We have done this for some years now, tells CEO Claus Steinland, it is something that we learned from Napoli after they beat us heavely in the Europa League in 2015. They was by fare the best team we have ever played. Steinsland tells that it is importent to try to be ahead of your opponents, especially since the biggest rival at the moment has a lot more money. The players are used to it, and it gives everyone a opportunity to see all the moves from above. Wednesday The Danish Champions play Astana from Kasakhstan at 15:30, while the number one in Denmark at the moment, FC Copenhagen, play Örebro at 19:00. It is a rare opportunity to watch the two best sides in Denmark on the same day.